The combination of the tender juicy crocodile meat with the freshness of the salsa verde and the earthiness of the root vegetables worked very well. This is the raw crocodile meat up close. Saying it tastes like chicken doesn’t do it justice. Like chicken, it has a fairly mild flavor. 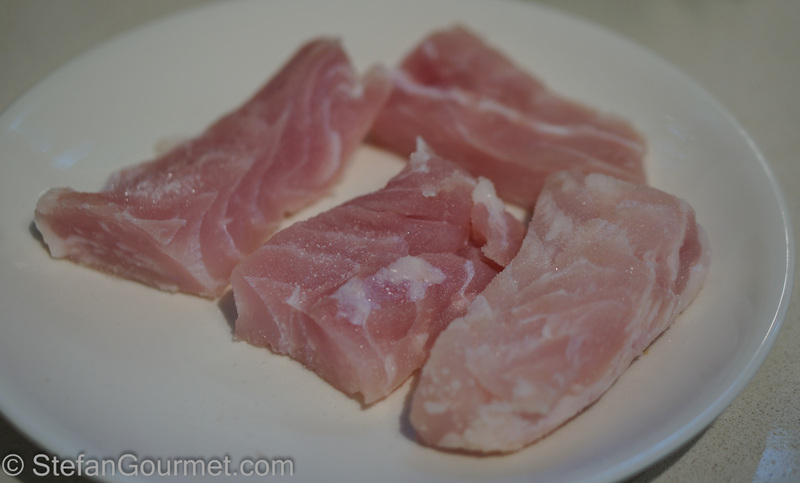 I like the texture of crocodile tail fillet better, as it is more ‘meaty’ without being more tough. The flavor is not exactly like chicken, but a bit like fish. 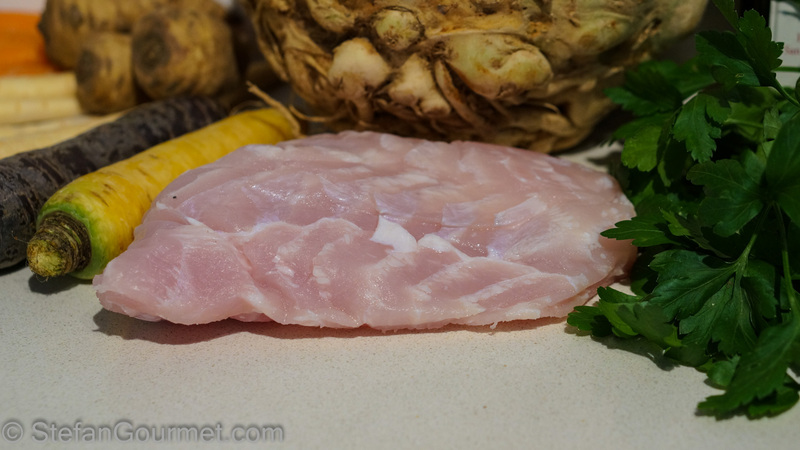 I’d say the texture and flavor are somewhere in between chicken and swordfish. I prepared this dish twice already, I liked it that much. 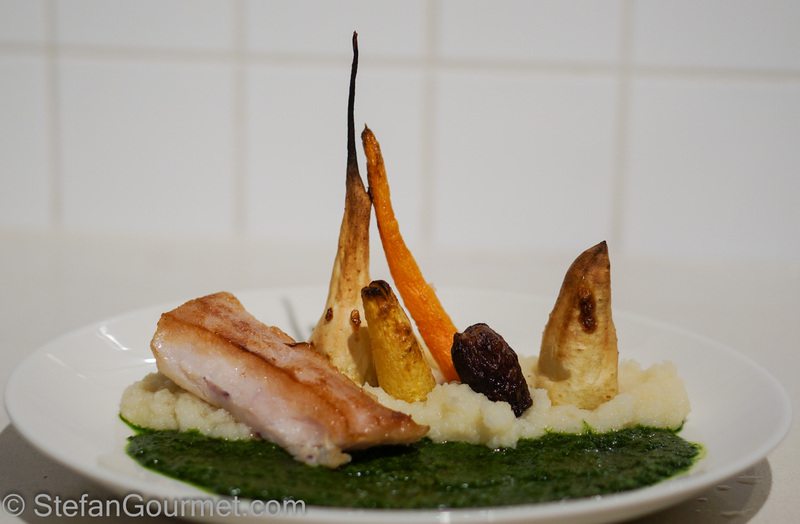 The first time I went with Paul’s latest try and cooked it sous-vide for 3 hours at 55ºC/131ºF. It was juicy and tender, but I thought that it could use some more time at the same temperature. A higher temperature would turn it dry, at a lower temperature it won’t become tender. 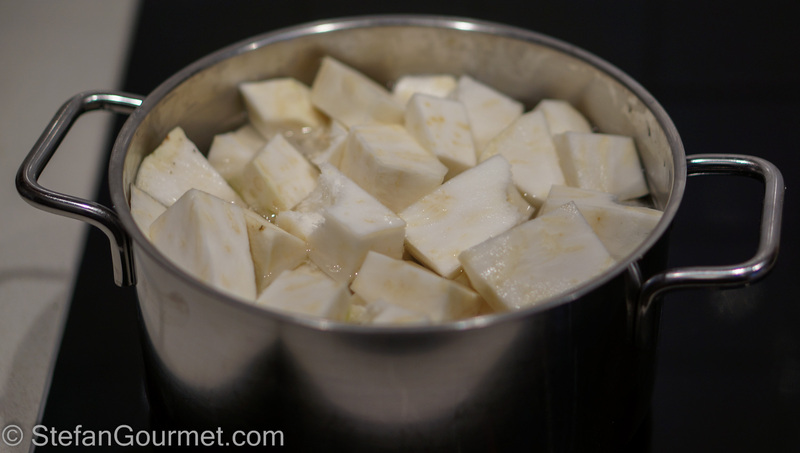 I tried it for 12 hours at 55ºC/131ºF, and that was perfect. It is still good at 3 hours if you are in a hurry, but if you have the time let it go for 8-12 hours. 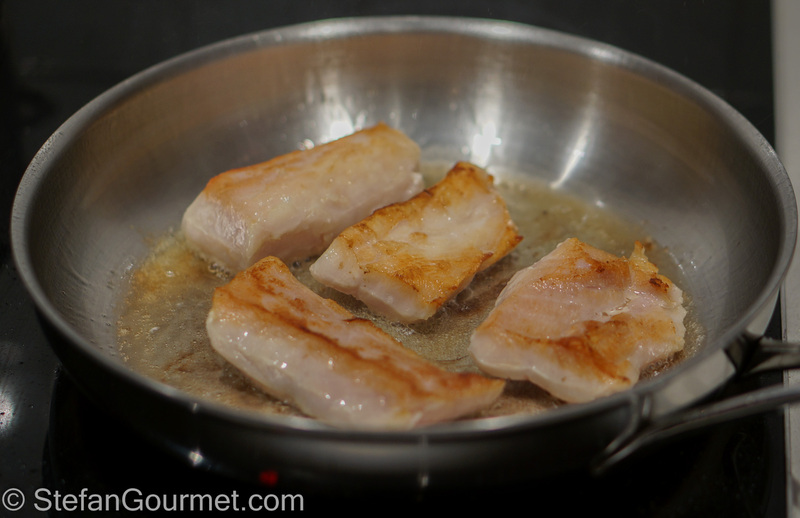 As crocodile tail fillet is prone to become dry, it is best to dry cure it before cooking. For most accurate results, weigh the crocodile meat and calculate 1.4% for the salt and 0.6% for the sugar to be used. 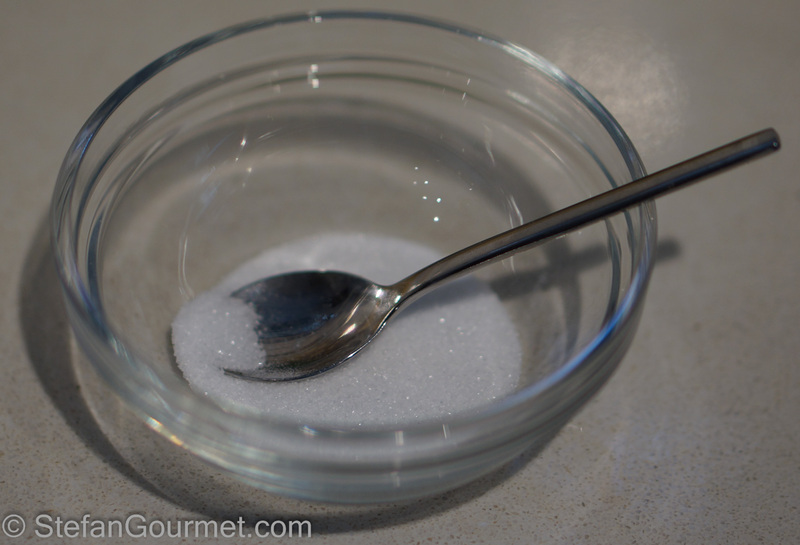 Combine the salt and sugar in a small bowl and stir to mix. Rub the crocodile meat with the curing mix on all sides. 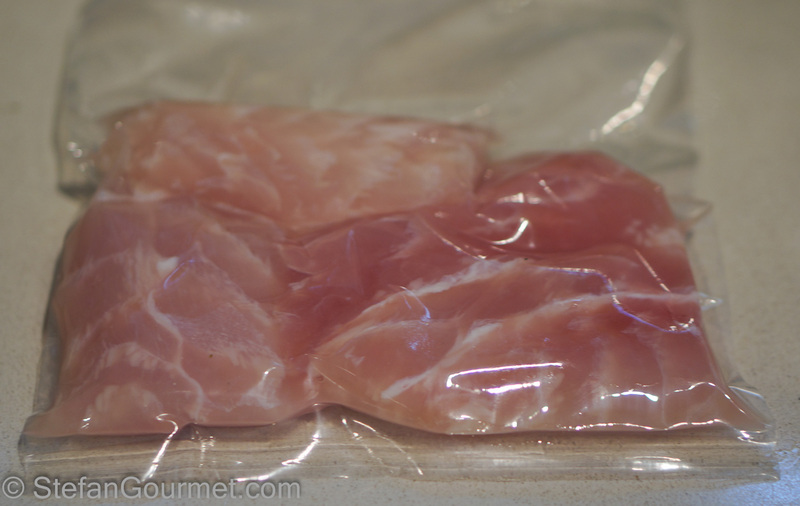 Vacuum seal the crocodile meat and allow to cure in the refrigerator for 1 hour. 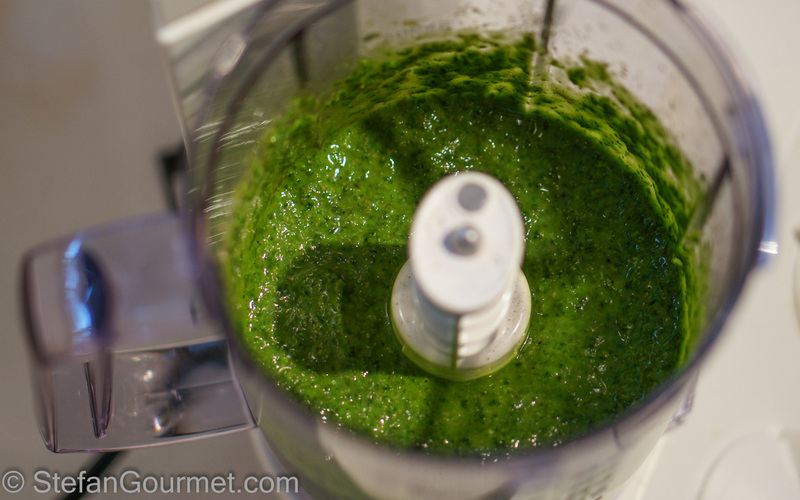 Meanwhile, make the salsa verde. 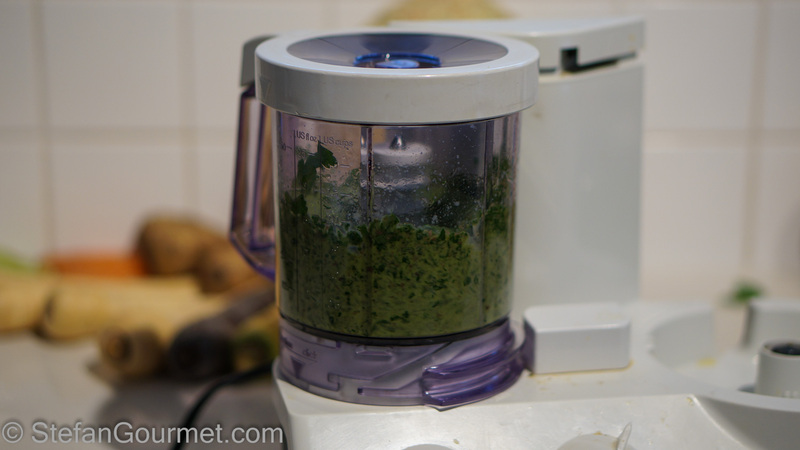 Combine parsley, vinegar, capers, and olive oil in a blender and blend until smooth. Taste and adjust the seasoning with salt and freshly ground black pepper. Refrigerate until ready to serve to allow the flavors to develop. When the crocodile has finished curing, take it out of the bag and rinse with cold water to remove the salt. Pat dry with paper towels and vacuum seal again. 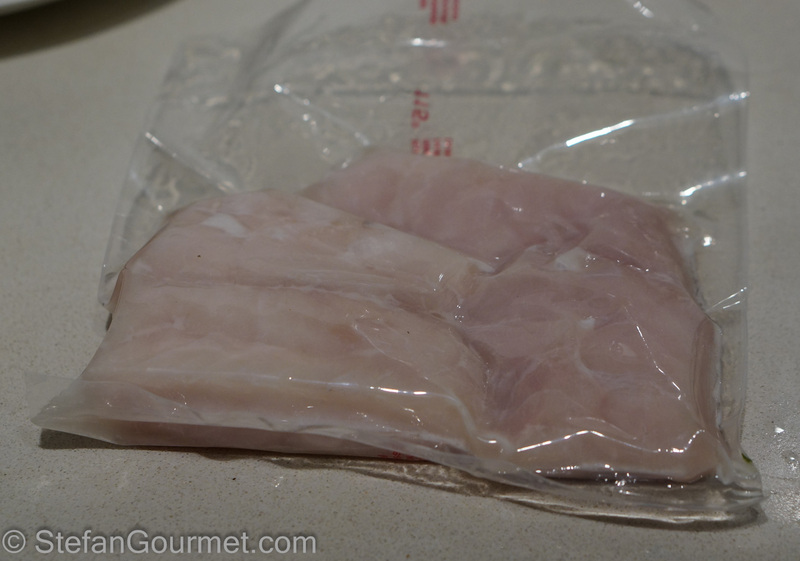 Cook sous-vide at 55ºC/131ºF for at least 3 but preferably 12 hours. About an hour before you would like to serve the crocodile, peel the root vegetables and trim them so they can stand upright. 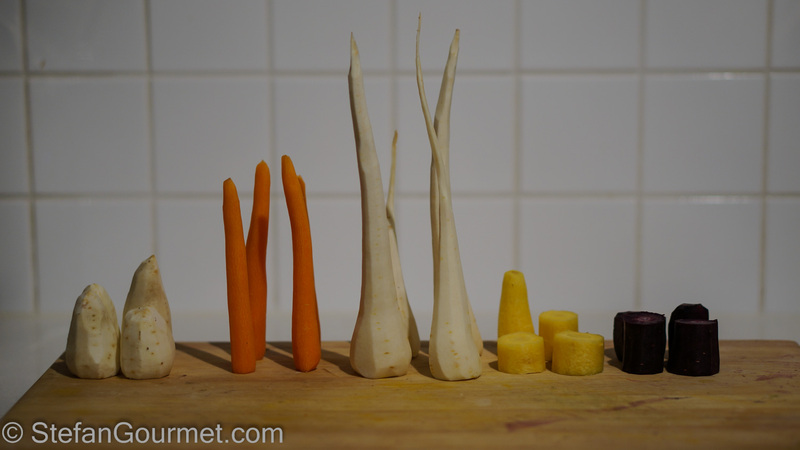 Larger root vegetables can also be cut into chunks if a whole one is too big for a single serving. I used three different colors of carrots: small orange ones, large yellow carrots and large purple carrots. 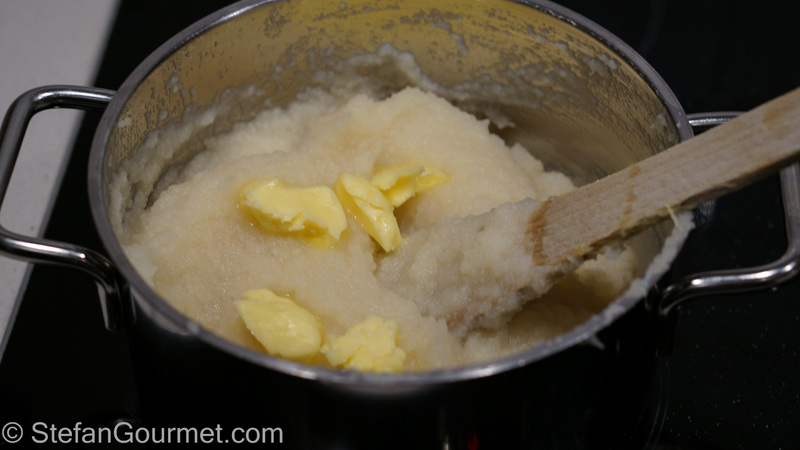 …and finish by stirring in some butter, salt, and freshly ground pepper. 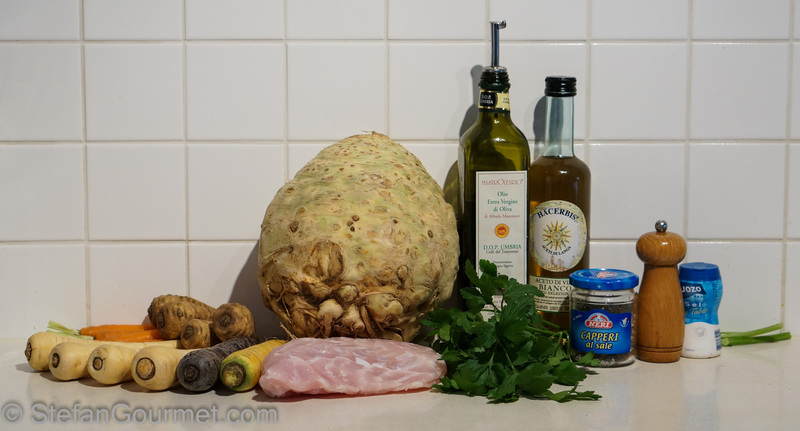 When the crocodile meat, the roasted root vegetables and the celeriac puree are ready, prepare plates with the ‘swamps’ and then brown the crocodile quickly in olive oil over high heat. Arrange the crocodile on the ‘beach’ and serve at once. We enjoyed this with a full-bodied complex white. A bit of oak is okay but not required. The full body is needed to go with the meatiness, the complexity is needed to handle the wide flavor profile of the root vegetables and salsa verde. If you’ve ever been invited to a “borrel”, a Dutch cocktail party after work or at a ‘function’, chances are that one type of snacks that was served were “bitterballen”. The word “bitter” does not refer to the taste of the balls themselves but of the alcoholic beverages they used to be consumed with: bitter herb beverages that are now often referred to as digestifs. Nowadays, the most common drink at a borrel is beer. Most bitterballen are made in a factory and sold frozen, but making your own is more fun and definitely more impressive. It may also be your only option if you’d like to enjoy these tasty snacks outside of the Netherlands. 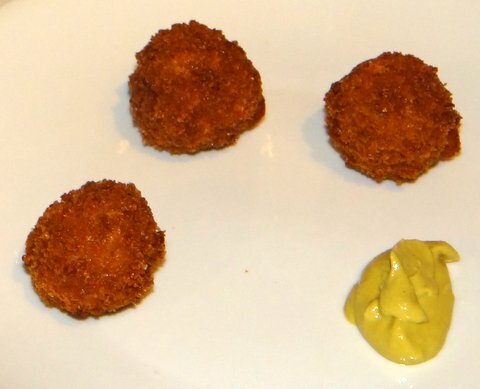 “Kroketten” (croquettes) are made the same way, just in a different shape. I truly do not mean to be rude, but one can easily buy crocodile meat, fresh or smoked, from a number of on line firms in Australia – ‘somethingwild’ in Melbourne being probably the best known! Not much taste, but an interesting comparison! There you go! Because most things are readily available in central Melbourne I don’t think to look online line for fresh products. Will look into it but will need to find an alternative cooking method. Oops! Methinks ‘somethingwild’ is actually Adelaide Central Markets but they are absolutely brilliant with all kinds of ‘strange meats’ on line. Good experiences! Do take a look ’cause the postage is not so bad!! Sorry Stefan about ‘forcing’ you Down Under !!!!!! Stefan – a very entertaining presentation. And as always superb detail and photography. Thanks! I have prepared kangaroo when I was Down Under, but only fillet. Unfortunately it is only available frozen here. Hi Eha, haven’t seen you on the blog for a while. Hope everything is OK? Fantastic artistry. I love the concept. I was going to say “You really pushed the boat out on this one.” But, that would be dangeous, what with the croc half in the river! I remember Paul’s crocodile post. It was so pretty and delicate. I love what you have done here too. It is very creative and fun. Not sure about croc, but alligator tastes more like modern-day pork. Keep up the good work! Looks great! un piatto decisamente elegante e interessante. Un impiattamento eccezionale, da architetto! 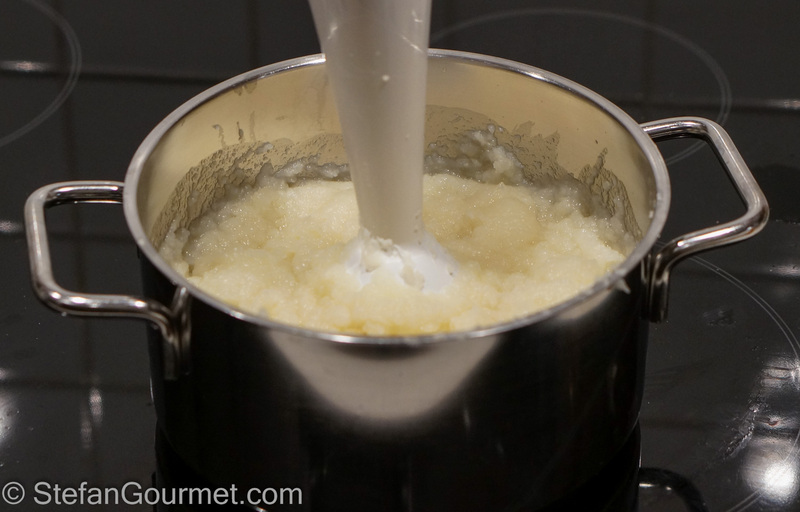 Un altro ingrediente bizzarro! Without a doubt a masterpiece. The crocodile meat reminds me of fish, which I suppose makes sense given they spend so much time in water. But the best bit is your photo of the vegetables pre cooked – the scene looks like a petrified forest – like a Dali painting – excellent work! Thanks so much — that is exactly what it was supposed to look like! I love the entire swamp plating!